Euro zone members have given Greece until the end of the week to come up with a proposal for sweeping reforms in return for loans that will keep the country from crashing out of Europe's currency bloc and into economic ruin. 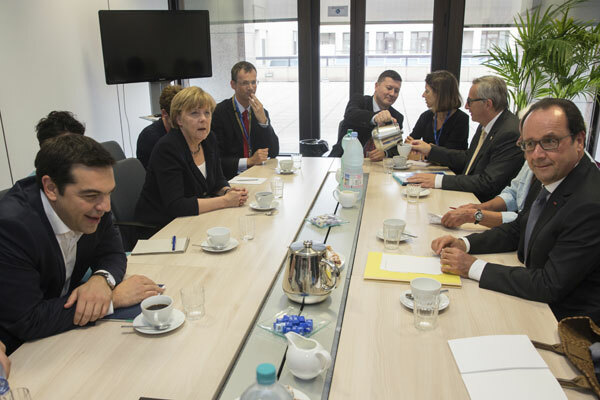 Prime Minister Alexis Tsipras has until Friday to present the proposal, but German Chancellor Angela Merkel said she hoped to have convincing reform commitments from Tsipras on Thursday so she could ask the German parliament to authorise negotiations on a new aid programme. At an emergency summit in Brussels on Tuesday, representatives of the 19-country euro zone said all 28 European Union leaders would meet on Sunday to decide Greece's fate. The talks were organised after Greeks voted in a referendum on Sunday against a bailout that carried stringent austerity measures. Failure, Tusk warned, would undermine the EU's standing in the world and said the six-decade-old bloc may face "the most critical moment in our history". Under a timetable agreed by the 19 leaders of the common currency area, Greece will submit on Wednesday a formal request for a two-year loan programme, with a first list of reform commitments to be spelled out in greater detail on Thursday. If the European Commission, the International Monetary Fund and the European Central Bank approve, Eurogroup finance ministers will meet on Saturday to recommend opening negotiations on a conditional assistance programme. "The ball is in Greece's court," Italian Prime Minister Matteo Renzi said, calling Sunday "the final meeting on Greece".